Children can be confused about different views on eagles. Primary school pupils are confused about contentious environmental issues such as the reintroduction of sea eagles to Scotland and the setting up of wind farms, a Scottish author has said. Paul Murdoch wants to see speakers from both sides of the debates invited into schools. The children’s author, who was born in Helensburgh, said youngsters needed to be equipped with information about conservation, especially when their daily lives give them first-hand insights. Murdoch said that in his readings at schools, pupils had very strong views that had come from their parents and were not always getting the chance to hear an alternative view. He has just released The Egg Thief – an adventure story about two youngsters Jenny MacLeod and her Polish friend Pavel Ulinski, on Barra in the Outer Hebrides, who discover someone is being forced to steal sea eagle eggs from nests on Mull. “A lot of children talk about what their parents think, give their views and then get puzzled when they hear other adults saying the opposite is true,” he said. “I’m a big fan of conservation and I used to hate it when people stole birds’ eggs when I was a kid. “So that’s how the discussion might start after I’ve done a reading from the book. “But while most kids nowadays know it’s not right to steal eggs, some questioned whether it was a good thing to have the sea eagles back at all. “Some of their parents are farmers or crofters and I remember some of the kids saying the farmers didn’t want the sea eagle because they were killing lambs. Then they hear someone else saying ‘that’s rubbish’. The author’s previous Jenny and Pavel book, Windscape, which has recently been updated and re-released, saw Jenny and Pavel caught up in the world of wind farm developers after hearing of proposals to site one on Jenny’s father’s croft. Ian Baillie, editor of Who Else Writes Like...?, a website that encourages readers to try works by a wide range of authors, said Murdoch had taken a neutral stance in his writing. 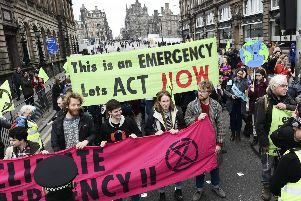 Sarah Beattie-Smith, senior climate and energy policy officer at preservation organisation WWF Scotland, said: “We know the children of today are the ones who will have to live with the consequences of worsening climate change unless we take action now.